Hot off the heels of the production company’s acquisitions of the rights to The Brave Little Toaster and Mr. Ed, Waterman Entertainment has picked up yet another family-favorite property. 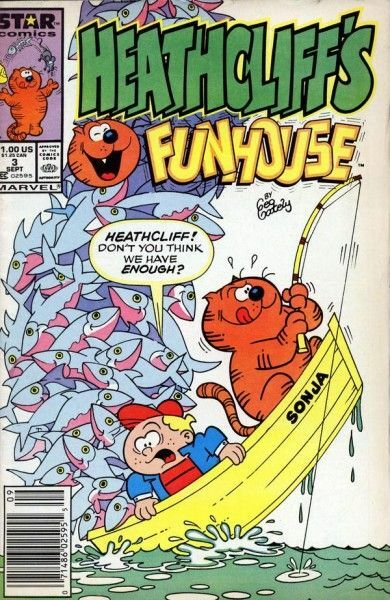 The company announced today that they are plotting a feature film iteration of the comic strip Heathcliff. As with Toaster and Mr. Ed, the film will be envisioned as a CGI/live-action blend with a contemporary storyline. Waterman Entertainment is the same company behind those awful Alvin and the Chipmunks films, so it’s safe to assume we’re in for a very commercialized iteration of Heathcliff. The Heathcliff comic strip, created by George Gately in 1973, centered on a wisecracking cat who enjoyed annoying his human companions (as do all cats in general, I believe). The character was previously adaptated for two different animated series in 1980 and 1984. Hit the jump to read the full press release. Los Angeles, CA (October 17, 2012) — Family-based production outfit Waterman Entertainment has secured the feature rights to the iconic comic strip character HEATHCLIFF, it was announced today by the company’s Head of Development, Cooper Waterman. Waterman made the deal directly with rights holder, Peter Gallagher. “Their track record is impeccable. Casper, Stuart Little and Alvin are examples of incorporating elements that past audiences loved and adding a contemporary flair that makes these properties endure with a whole new generation. That is exactly what I was looking to achieve with Heathcliff. We want our existing fans to identify with the characters they know while introducing him to an entirely new audience. As a creator I know that they will be attentive to our lasting vision for the brand and welcome our input, which is very important to me,” said Gallagher. The acquisition comes on the heels of the company making similar feature film deals with rights holders of the iconic family brands including THE BRAVE LITTLE TOASTER and MR. ED. As is the case with those titles, HEATHCLIFF will be reimagined as a CGI/live action film with contemporary storylines, while preserving the original essence that the respective right’s holders created for each of the characters. Additionally, Waterman Entertainment retains global licensing and merchandising rights to HEATHCLIFF which they will leverage through producing thirteen original episodes of the wisecracking cat’s adventures for television. TOASTER, ED and HEATHCLIFF represent an arsenal of existing and successful family brands that can be developed into live action/CGI feature film properties. Furthermore, the company is committed to finding iconic properties that can be revived for a new generation of fans and exploit their ancillary viability on platforms including television, mobile, digital, literary, and merchandising. Steve Waterman, who founded and manages the company along with his sons Tucker and Cooper, has served as an Executive Producer on theatrical features including CASPER with Universal; ALVIN AND THE CHIPMUNKS, ALVIN AND THE CHIPMUNKS: THE SQUEAKQUEL and ALVIN AND THE CHIPMUNKS: CHIPWRECKED with 20th Century Fox; and STUART LITTLE and STUART LITTLE 2 with Columbia Pictures, among other credits. Waterman Entertainment (www.watermanent.com) is a family-owned and operated media and entertainment company that focuses on creating, financing and distributing film, television, and digital media properties across multiple platforms for family audiences. The company works closely with creators and rights holders and manages all licensing rights to their brands and characters to exploit ancillary revenue streams tied to worldwide theatrical releases.